I figured that going through the boxes sent form my Grandmother's house would turn up a few surprises. I was prepared for antiques and old tins and the accouterments of elderly life. I was not prepared to find two California raisin Halloween costumes. I thought the raisins were freaky enough back when they were popular, it never occurred to me that people would dress up like them. However, there there are. The costumes look like they could be handmade from pre-printed panels (they are simply straight stitched with the edges left raw), but if so it must have been part of a kit because there is a plastic piece to give the face area some structure. 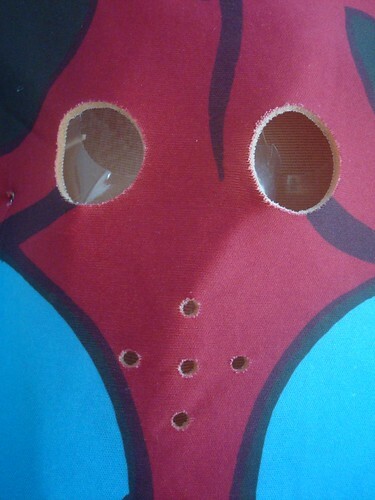 Speaking of which, wasn't it nice of them to add not only eye holes but air holes? I'm guessing that one of my Aunts made these for her daughters but why they were saved is beyond me. They certainly don't look the 20+ years old that they are, even the plastic is in good shape. Do you remember the California raisins? Did you think they were awesome or creepy? I LOVED THEM! But I don't know why...Heh. Those are hysterical. YES, I DO! 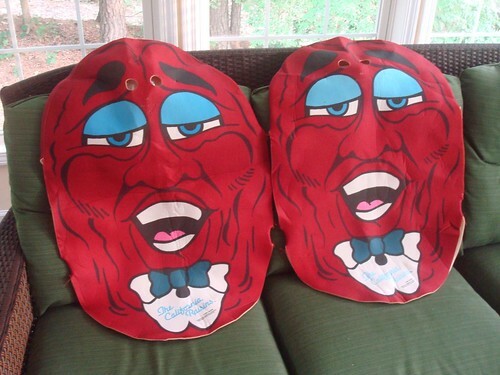 I thought they were cool, at the time, and I remember every kid in my class wanting to eat raisins because of the California Raisins. I liked them too but I can't remember why. I have a recollection that they were hilarious. We did have a slice of fake bread with 3 or 4 California raisins that sang on it. Don't remember what they sang but must have been good or Mom wouldn't have allowed it, she was particular about those sorts of things. Never saw costumes before! I loved them, although I don't remember a thing about them. I used to have bedsheets of them and they were my favorite (until the Lion King ones. And then the Goosebumps ones.) I actually disliked raisins, and generally still won't eat them on their own. Those costumes are classic!